The Large Round Star Design Copper Bar Sink features 5 nautical star motifs around the interior of the basin and a flat rim suitable for drop-in or undermount installation. The flat bottom keeps your glasses and dishes from falling. 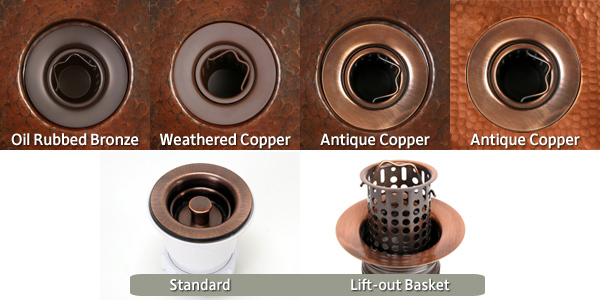 This sink is hand-hammered in 17 gauge, lead-free copper by 3rd generation coppersmiths. *Please allow 3-5 weeks (2-3 weeks production time, and 7-10 business days delivery time) for your sink to arrive. We find that ordering well in advance to your installation time is best. We ordered this copper sink for our new Office Coffee Bar and just love it! It looks great. We liked it so much, we bought 2 more copper sinks for our remolded bathrooms. This sink is absolutely gorgeous! It looks great in our wet bar. Great product and service.